Hawaii Business Magazine - "Gen Y Changing the Workplace"
The advantage of having a Genergraphics® web site built using Genergraphics services is that the client can use their demographic advertising campaigns within traditional media to drive customers to their web site and let the Genergraphics process do the rest. Once a customer reaches your home page, effective buzzwords incorporated into home page links will be highly accurate in getting a generation to open up the mini web site that most appeals to his or her generation. The buzz words are from a generation's youth and are retained for the most part the rest of their lives. 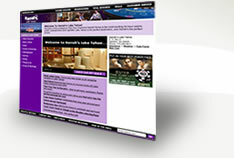 "Sweet Deals on Bedroom Sets"
"Far Out Living Room Specials"
Once a customer clicks on the appropriate link that appeals to his/her generation, they are brought into their own mini site (a site within the master site) that specifically speaks to them and provides products and services geared to their needs. 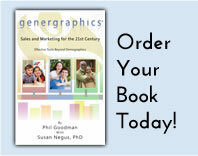 Text, graphic design and visuals are designed to appeal to specific generations. In addition, business logic on Genergrahics web sites is also specifically geared toward each market. Example: For the senior market a call to action may consist of a 1-800 phone number for credit card orders because the senior market is still skeptical about the security of providing credit card data over the Internet. However, for the Gen-Xers and Echo Boomers, the site would offer online, real-time credit card purchases with live video chat with customer service representatives.